Relics: Ankoku Yōsai (レリクス暗黒要塞, Relikusu Ankoku Yousai?, lit. "Relics: Darkness Fort") is an action-adventure game developed by Bothtec for play on the Family Computer Disk System and published in 1987. 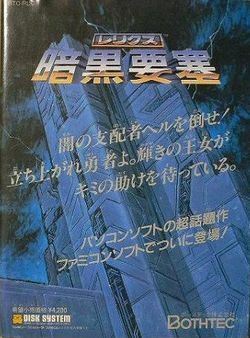 It is somewhat related to, but entirely different from, a game known as Relics which was released on several popular Japanese home computer formats, including the MSX. In the game, you control a spirit who has the ability to enhabit the body of certain defeated enemies, effectively powering up by inhabiting the body of stronger foes. Graphically speaking, Relics: Ankoku Yousai is incredibly ambitious for a Famicom Disk System game. The large enemies and incredible amount of detail that the surrounding environment is drawn with is impressive. But this visual ambition comes at a heavy cost to the game play; the game constantly loads new areas from disk even after you've only walked a short distance. These constant loading interruptions easily double the amount of time you will spend playing the game, simply waiting for the graphics to load into memory. In 2002, the compilation Relics Anthology was released for play on Windows PCs, which contained emulations of all six systems which played the original Relics title, as well as this version of Relics for the Famicom Disk System. Reportedly, the loading issue was fixed in this conversion, allowing for a more fluid playthrough of the game. At some point in the early history of earth, the forces of darkness known as HELL were at war with the forces of light known as HEAVEN, and the took this battle to our planet. The HELL forces quickly enslaved human beings, and the earth was cast in darkness and despair. Somewhere on the planet, a fortress was built to harness the power of the sun in order to defeat the forces of HELL, should they ever come to our planet, but it fell into ruin after centuries of neglect. The Shining Princess of HEAVEN was captured and imprisoned on the top floor of this fortress. Also inside are the spirits of the Holy Warriors of Light who have the power to defeat the forces of HELL. However, they are asleep and unable to awaken. Earth's only hope is you, a being who has sacrificed his body in order to inhabit the fallen bodies of the departed. To succeed, you must use each body to obtain the key words which are found in, and used to open, the dungeons of the fortress. This page was last edited on 17 November 2013, at 00:33.